I have a large Microsoft Excel file that is shared between users in my office. The file has a macro and a set of data validation. The file is used the last two weeks of every third month. The file worked perfectly before Christmas, however, we encountered errors in March.The following error appeared when the file was opened. After clicking yes, the following appeared. 'Stops screen refreshing to save time. 'Loop to check if oppt if unit or non unit deal. Checks if oppt is in array and adds oppt if not. 'Calculates total revenue per opp. 'Non Unit deal in the array already. Deletes line and shifts row up as well as i up. 'Unit deal in the array already. Range("J" & i) = ""
'Not in array so needs to be added. Range(Cells(i, 19), Cells(i, 26)) = ""
'Redefines the size of the array factoring in new added row. 'Adds blank column for business manager. Range("AH1") = "New PO Date"
Range("AS1") = "Commit + X"
'Moves to Sheet2 and copies Upside X column B to the end (column AV) for the purpose of VLookup. Then returns to Sheet1. 'Loop to add Linked status; and to complete VLookups from yesterday. Range("M" & i) = "Not Linked"
Range("M" & i) = "Linked"
'Format Revenue column K - no decimal, 1,000 seperator. 'Adding Conditional Formatting Order Number column J, to highlight all duplicate values so that all oppts that have more than one row are red. 'Msgbox to advise when macro is complete. I have figured out a number of work arounds, however, these slow down our productivity, and the error can comeback later on in the day. Can somebody tell me what is the likely cause of this problem? To avoid a lengthy comment section we continued in chat last night. It wound up being quicker than anticipated. He provided the definedName block below. Although there are a number of things I saw that may/not have contributed, it looks most like a broken relationship in the shared views. It is a shared workbook, on a network drive, and by the looks of it there are 6 different machines that have all stored some personal view data. The syntax all looks OK, so without seeing all of the sheet*.xml files, its probably in one of the <definedName>, and <customWorkbookViews> / <customSheetViews> nodes which all relate based on GUID. It's an easy thing to lose control over as those GUIDs are generated by excel at runtime. Turning off "Filter Settings" in Review Tab>Share Workbook>Advanced Tab, under the "Include in personal view" heading will remove all of the .wvu named nodes from worksheet.xml, as well as *View(s) nodes from sheet*.xml, and keep them from re-appearing. This will either fix the issue, or reduce the candidates to one user defined, and one system defined range. Chances are that a recent save hiccup left some file parts without an update, and thus a broken relationship. Drawback: Only one view state can be saved, so you will see the last users format/filter changes upon opening the file. Hope it really fixes it! If not, we'll go another round. The customSheetViewClass doc states that the GUID "Shall correspond to a customWorkbookView", where the customWorkbookView needs only to have a name containing a globally unique GUID (redunant I know, but its in the docs). 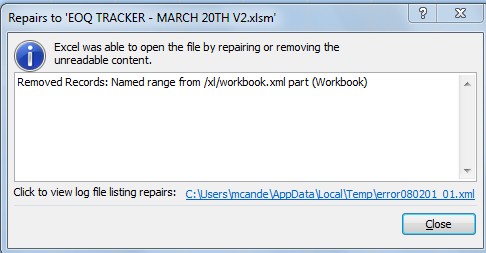 Failing the "Shall" requirement will result in the "Removed Records: Named Range from /xl/workbook.xml/ part (Workbook)" repair message. Excel formula for VLOOKUP with changing look-up value across all rows?